The nave walls may be C11 or C12, with a south aisle and long chancel that are C13. The tower is probably C14 and some detail is later. 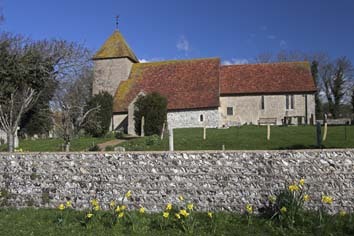 Tarring Neville consists of a small group of houses on the present main road from Lewes to Newhaven, under the Downs and is one of the few villages on the eastern side of the Ouse valley. The living was united with the equally small South Heighton in 1664 (WSRO Ep I/167 fo. 84r). After lightning damage, its church was taken down in 1772 (WSRO Ep II/27/17) and the materials used to repair Tarring Neville church, though traces of its walls were still to be seen in the mid-C19 (Hussey p238). Plans for a new church there in about 1904 by R Halls (ESRO Par 374/4/1/1) came to nothing. Much of the church is covered in cement render. Unattractive of itself, removal would allow close examination of the fabric. At present, no detail earlier than the C13 is visible, but an undated Sharpe Collection drawing shows what could be long and short work to the north of the low nave. Though not necessarily a sign of pre-Conquest date, it could suggest a C11 origin. The same drawing and a second one of 1802 also show what appear to be round-headed windows in the upper part of the tower, so it might be of the same date. The present detail, inside and out, is C14, but the lack of buttresses would be consistent with an early date. 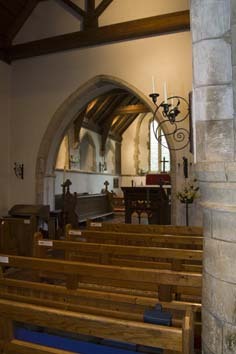 In the early C13 a south aisle was added and the chancel was extended or reconstructed. 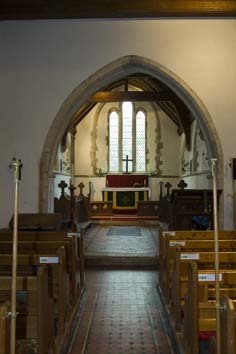 The latter is long by comparison with the nave and has lancets, including pairs towards the east end on both sides. Their high sills inside are linked by a string-course. The rere-arch of a plain post-Reformation square south window near the junction with the nave shows it was adapted from a lowside. The chancel arch is early C13 with a single, slight chamfer and square responds with plain abaci and deeply cut stops of an unusually jagged profile. It is a little earlier than the two-bay arcade, which has chamfered responds, small attached semi-octagonal shafts, double-chamfered heads and a round pier with a deep capital. The low aisle with a lean-to roof has renewed lancets and a segmental doorway (renewed but probably representing what was there before). A blocked lancet inside Indicates later alterations. The C14 detail of the tower includes a big ogee-headed west lancet and a small chamfered tower arch. The bell-frame is also C14 (Elphick p227) as the tiled pyramid spire may be. It is not known when after 1802 the round-headed openings in the tower seen on the Sharpe drawings gave way to the present square-headed ones. The earlier drawing also shows a tall pointed arch to the north with a triple-chamfered head and a shaft on its west respond. It looks C13 at the earliest and may suggest a tower-transept, which would have been uncommon then. It would be more explicable as part of a possibly C11 tower that was altered later. The aisle has a C15 two-light square-headed east window and there are sockets of that date for the rood-beam, barely 5ft 6in off the ground. Repairs in 1772 have left no trace except possibly, the plain south porch. 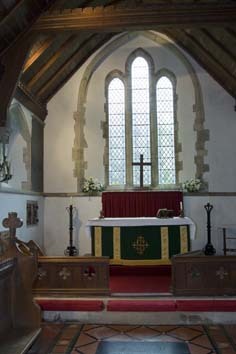 An east window with wooden Y-tracery and curious corner-finials shown by Adelaide Tracy (IV p11) (1855) and a timber-framed north nave window on the undated Sharpe drawing would be consistent. The render of the tower is dated 1826 and the Sharpe drawings show that previously it had flint walls, patched in brick. In 1871-72 R N Shaw restored the chancel ((Saint p410) – a drawing of the chancel by him in A 38 p297 (1887), when further work was contemplated, may be connected), with an east triplet of lancets and a new roof. His choir-stalls echo the castellated wallplates. His plans of 1887 for the rest of the church (A 38 ibid) were not carried out and in 1893 Philip Currey signed the plan accompanying an application to the ICBS for financial assistance for this work. He may thus be presumed to be the architect who designed new lancets in the north wall of the nave and replaced the roofs. In 1957 Carden and Godfrey (see W E Godfrey) undertook repairs (ICBS). Aumbry: (North chancel) Much restored double, probably C13. Choir stalls: As noted above, by Shaw, with big poppyheads. 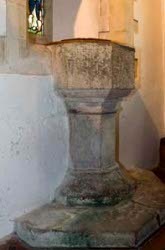 Font: Plain C15 octagonal bowl, set against the wall in the aisle since 1892 and noted earlier by Adelaide Tracy as fixed to the north nave wall. The intention of this unusual arrangement may be to conceal a crack (Langdon p257). Glass: (South nave, second window, above the font) J Powell and Sons, 1892, designed by J W Brown (Hadley list). 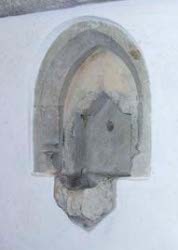 Piscina: (South chancel) Pointed C13 head with a broken bowl. My thanks to Nick Wiseman for his comments on the Powell glass and for the colour photographs of the church.